Rustic Christmas Tree. This tree makes me feel like I'm in a warm cozy log cabin up in the mountains. I love the look and feel of this tree and the details within the tree are breathtaking. 2. 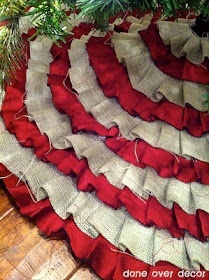 Burlap Holiday Pillows. Pillows are so very easy to make. I think that pillows are the best thing to start off with if you are taking on sewing for the first time. Pillows are the most inexpensive way you can transform any room at any time of year. 3. Holiday Wreaths. Whether simply made with fresh garland from a local grocery store or an ornate one with ribbon, ornaments, and glitter, wreaths are an absolute holiday staple. 5. Fireplace. The fireplace has been proclaimed as Santa's "doorway" to our home. I can't leave it plain, so I found many different inspiring photos in magazines and online that I will definitely try my hand at. I will be adding a touch of burlap to mine and wooden ornaments that will add a rustic feel to tie my entire log cabin, winter decor together. So how are you guys decorating for the holidays? Post pics here.